Go Deeper: What to Read, Watch, and Download Before Visiting HonoluluOur list of essentials includes the Holoholo podcast, how-to pidgin videos, and some very enviable Instagram accounts. Mai Tais, Lava Flows, and Japanese Whisky: Where to Drink in HonoluluThe bar scene on Oahu is as diverse as the island itself, slinging polished cocktails and craft beers alongside neo-tiki concoctions. The Insider’s Guide to Honolulu’s ChinatownHonolulu native Laurien “Lala” Nuss highlights the wet markets, galleries, restaurants, and performance spaces that make the area special. Poi Donuts and Other ‘Broke Da Mouth’ Desserts in HonoluluWe hope you packed your stretchy pants, because this city is delicious. What to Do in Kaka‘ako, Honolulu’s Hippest NeighborhoodWhatever you’re into right this hot minute — yoga, street art, karaoke, fancy toast — you’ll find a version of here. Where to Buy Reversible Bikinis, Vintage Kimonos, and More in HonoluluDon’t waste money on dashboard ornaments and cheap ukuleles. Shop for locally made keepsakes instead. Honolulu’s Best Beaches for Surfing, Snorkeling, and SunrisesThe hit list includes Diamond Head, Lanikai, Makapu’u, and of course Waikiki. Where Organic Farmers and Top Chefs Eat in HonoluluOahu is teeming with farm-to-table fare, though it’s true — many locals still have a place in their hearts for Spam. 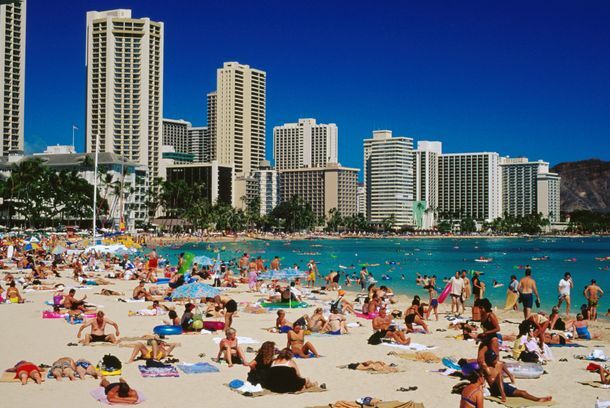 Week 5: Honolulu Is a Real City, Not Just a Vacation DestinationWaikiki is still a hit with tourists, but an inspiring wave of homegrown entrepreneurship has thrust many other neighborhoods into the spotlight. Where the Locals Would Stay in Honolulu If They Weren’t LocalIncluding tropical boutique hotels, stately legacy resorts, and a beach spot that’s perfect for budget travelers.